LG Refrigerator Error Codes – Error Code Definitions – How To Fix? LG Refrigerator Error Codes – Is your LG refrigerator displaying an error code? These error codes are for LG refrigerators. The error codes can assist you with troubleshooting what part or component is causing the error. See below for ALL error codes an LG refrigerator can display. Find the reason why your LG is malfunctioning and replace the part yourself to save money. 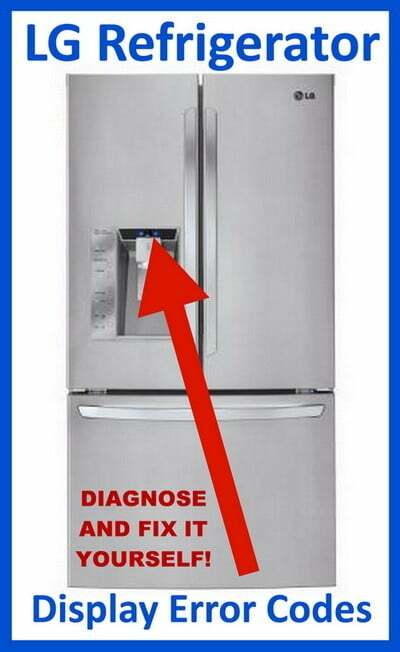 Some of these error codes MAY require the assistance of a professional appliance repair service. LG Error Code OF F or O FF = Refrigerator is in display mode = Check information here on how to reset LG fridge with OFF on display. To test parts to see if they are good or bad, see the video below on how to use a multimeter to test electrical parts. Once determining if the part is bad, you can order parts at SearsPartsDirect for LG or Amazon has many OEM LG replacement refrigerator parts. Do you know of other error codes or having issues with fixing your LG fridge with an error code? Please leave a comment below. We had an Er 15 or 1S and unplugged the fridge and plugged it back in and that cleared it. I had a Dh error message and unplugged it. Cleaned around the fan by the compressor but the refrigerator still not cooling. I do not feel any air coming into the frig with my hand when I open the door. But the bottom freezer is blowing and cold, with ice tray frozen solid. Would this be a defrost heater issue, PCB or Fuse? And A video how to replace these, please. My LG refrigerator has error code dh. Repair or Check Defrost Heater or PCB or Fuse. I need to know what PCB stands for and would the diagnosis be deficult for DIY? What repair would you recommend first? Thank you for your answer in advance. I have a LG 3 bottom freezer, French door refrig that shows error all of a sudden. Model number LFX25991ST. 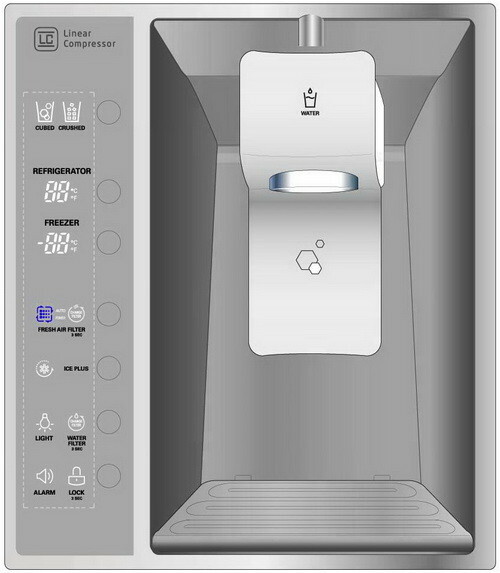 It will not allow to dispense ice or water. I did unplug for a short time and plugged back in and it cleared the panel and water was able to dispense. All above is very usefull. I do know how to use a multimeter. But I do not know the parameters of this refridge fan. After I connect power to our LG unit, it will run compressor and fan. Fan will cycle 10s/10s on and off 5 times, will display Err FF and shuts the fan off. What fan’s parameter the control board does not like? i have purchased Double Door LG Fridge GR-G712JTQ and its 12 year old model. it was working perfectly but from past few days there is an Error appear on its Display name “H”. i have tried alot to fix it but the Error H didn’t remove even now. Need your expert advice that what should i do in this regard? i hope that you’ll reply me ASAP regarding this. We are getting a code of ER and one of F5, but cannot find what this means. Can you please help? We have an 9 year old LG LFX25960ST and we have Er CO on the display screen. Will it still keep the fridge cool enough for a day and the freezer frozen? I have a 2 year old LG lfxs24623s with french doors. The center mullion shorted out. Apparently the wires chafed enough to touch and arc and burn through. I thought it would be an easy fix, replace the mullion, which I did, but it is clearly not working and condensation builds up. Any ideas? LG should have replaced our refrigerator 4 years ago. So many many things went wrong with it the first year and now, at 5 years old the compressor was bad, replaced it. Still not cold. Making sound like a plane is taking off, Codes this time ER and FF. I hate this LG refrigerator and will never buy another. I have an LG LFX31945ST/02 french door that have cooling issues. The motherboard, compressor and dryer has been replaced. Now the unit cools down but up to 48F only (freezer). During self test mode all evaporator fans work and the unit has been plugged since 24 hrs. Looked at the coils and no frost. There are no error codes on the front panel and no flash codes on the motherboard. Before new motherboard and compressor, unit won’t cool at all. I have an LG bottom freezer, model# LFXS30766S02. I have an error code “e” and “rF”. I replaced the fans in the freezer section, still have the same error code after I turned the refrigerator off for 3 hours. I have to reset every 3 hours in order for the error code to go away. The ice and water dispenser works during the reset but do not work when the error code is on. I then change out the main PCB board in the back of the refrigerator where the power cord is. I still have the same error code but now the ice and water dispenser do not work at all. Even during the reset period or during the error code period. If you have replaced the freezer fans and the main PCB board on your LG bottom freezer refrigerator, then you may have a simple wiring harness or communication error. Recheck all wiring harness on the boards, fans and near the display panel. My LG LXFC24726S is having the same issue as Penny, displaying the E rF code. It was making a noise that sounded like a fan hitting its housing and when I turned off the ice maker it stopped. I am comfortable repairing about anything but is there a schematic somewhere of this refrigerator and where the fan is that you are referring to? And where can I buy the part? I will NEVER buy an LG again. My former fridge (GE Profile) lasted 24 years, this one is one month out of warranty and already broken. Here is the manual for your LG Refrigerator LXFC24726S. You may need to scroll down to the PDF Manual and click it. Once you have the PDF file open, scroll down the manual to the troubleshooting section. There you will find a few things LG recommends to try but the info is limited. The LG refrigerator Ef rF error code on the refrigerator’s display indicates an abnormality in the Refrigerator fan motor or possibly a bad main board. The fan is the most likely issue as most people that have the ef rf code change out the fan motor and it fixes the LG refrigerator. LG Refrigerator fans can be found here. LG Refrigerator Main Control Board can be found here. I have a LG bottom freezer model number lfx25975st /02. On the display panel an E comes on the screen. If I unplug it for 30 seconds and plug it back in the display lights up like it should but a minute later it goes back to a display showing just E. In the meantime, no water or ice. What is the problem? Is the error you see on your LG Bottom Freezer showing an “E” or “Er”. LG does not list only “E” error code in the database. Have you tried resetting the refrigerator by pressing and holding the buttons on the display? Is the LG fridge brand new? Now that I have read the issues that people have with their LG I will never buy one again – 3 years is all I have had my LG – my control panel lights don’t work and now this error message that I can not read because half of the lights on the digital display do not light – I know it is an E but can not make out what the other is so do not not if it is the “if” scenario or a number – 3 years is not long enough for a refrigerator to last. My LG refrigerator has the code E rF. Do I have to replace the fan motor? Or what? The ice and water is not working. The rF error code on your LG refrigerator’s display means an abnormal refrigerator fan motor. Check to be sure the fan is properly connected and getting power. If so and it still does not work and the error code comes back, then yes, replace the fan motor. How do I know which is what is wrong? This makes me ill. I bought this very expensive refrigerator (french doors, oversize, stainless steel) to replace one I thought was going out three years ago. I kept the old one as a backup in our laundry room. The one in laundry room is still going, this one keeps getting this error code. I tried turning it off overnight, it worked fine for about two hours after I turned the switch back on, but it’s back. Any help is appreciated, I am not a repair person at all but willing to learn! The IF error code indicates that the refrigerator has detected a problem with the refrigerator’s ice maker fan. This can sometimes occur when frost or ice buildup occurs around the ice maker fan. Note: For french door refrigerators, please check the gasket along side the door. Frost buildup can occur if the doors on the unit are not aligned properly. For more information on door alignment and proper refrigerator leveling, refer to LG Refrigerator Leveling Instructions. My LG fridge has err and ff on my display. I am also hear a vibration when I close the doors. When I open the doors the noise stops. LG fridge has error err and ff = That error code is your freezer (evaporator) fan motor that’s inside your freezer. It will need to be replaced. Your frozen up on your evap coil behind the bottom back panel of your freezer. Get a hair dryer and try to defrost the coil or leave unplugged for a day. Best to remove the back panel of freezer and apply hair dryer. Short term fix for defrost cycle not working. We have a double door LG fridge and freezer – Serial No 406TRCNOK843. The computer shows at Freezer dH and at the Fridge E. What should we do? We bought the refrigerator a year ago. An dH error code on the LG refrigerator’s display means that the unit spent more than 1 hour trying to defrost. During defrost, the refrigerator will increase the temperature at the evaporator to a preset temperature depending on the model. If this temperature is not reached within 1 hour, the DH error code will display. You may have a defrost issue with the fridge. Have you given the fridge time to clear the error on its own? You may need to give it some time and it will go away since it is happening during defrost mode. Try unplugging the fridge for 10 minutes and see if that clears the errors.